Mick Ronson is one of those quiet legends of rock & roll, important and influential not for any single thing but rather for everything. Ronson was a talented guitarist, but no six-string wizard. He was an better-than-average songwriter with a flair for drama, but a perfunctory vocalist. As a producer and session pro, Ronson offered a light hand tempered by experience and knowledge. It was the total package, however, including Mick's enormous charisma and his innate ability to bring something valuable to the work of some of the biggest creative egos in the biz, that made the man a capital 'R' Rock & Roll Star. 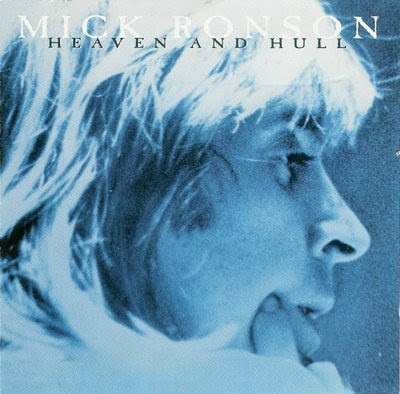 Ronson died of cancer in 1993, feverishly working to create this last album, Heaven And Hull. As a creative swan-song, few artists have accomplished so much. Heaven And Hull, named after Ronson's hometown of Hull, England, is an excellent showcase of pure, unadulterated rock & roll spirit. Many of Ronson's old mates showed up to contribute, including David Bowie, John Mellencamp, Crissie Hynde and Martin Chambers of the Pretenders, Ian Hunter, Brian May of Queen and others. The music created is no mere tedious superstar collaboration but rather timeless, bright and shining rock & roll. Cuts such as Like A Rolling Stone, All The Young Dudes or Life's A River are classics in any era, performed here with great tenderness and sincerity by the various assembled artists. Through all the cuts runs a singular thread, however, that of Ronson's guitar and indomitable presence.